One in seven (15%) of the population is deaf or hard of hearing. That’s 8.7 million people in the UK. Many cannot hear fire alarms or public address announcements. In bed even hearing-aid wearers become deaf as they sleep without hearing aids. Deaf Alerter is the system that overcomes these problems and assists compliance with the Disability Discrimination Act (DDA). Deaf Alerter is a patented, radio-based fire alarm warning and public address messaging system for Deaf and hard of hearing people. On seeing the sign (below) a deaf person knows that the building is equipped with a Deaf Alerter transmitter and that their own Alerter (or one borrowed from the building’s reception) will operate anywhere in that building. 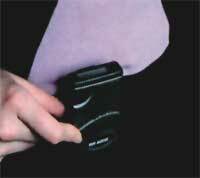 Widely installed in the UK, Deaf Alerter is now being utilised worldwide. 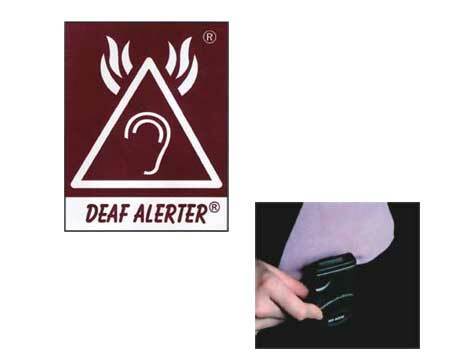 Deaf Alerter is primarily used for fire alarm and public address messaging but also used for bomb evacuation warning, personal onsite messaging and equipment alarm warning. Deaf Alerter consists of a VHF radio transmitter and associated aerial, which is permanently connected to the building’s fire alarm. On activation of the normal fire alarm system, the Deaf Alerter transmitter automatically sends a message to every Alerter in the building. The transmission repeats until the building’s fire alarm is reset. In hotels, halls of residence and nursing homes, deaf people face special barriers when they lock their bedrooms: they cannot hear alarms or knocking on their doors. To cater for this, the users place their Deaf Alerter into a portable bedside H16M CRAMS, which on receipt of the fire alarm switches on a ‘ vibrating pillow pad. 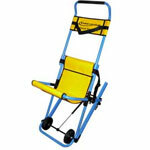 As the system will work in every room of a building, deaf residents or guests do not need allocation to special rooms. Public address or personal messages can be activated using a range of accessories including Push Button Message Points, telephone touchtone pads or a PC running Deaf Alerter software. The transmitter has f built-in battery backup to cater for mains failure and is constructed to comply with the relevant sections of BS5839. Where the building fire alarm is an addressable loop, Deaf Alerter can be continuously monitored by the fire panel. ‘ The transmitter, which requires no user access, is often placed in an electrical riser. The metal-cased (IP55) transmitter’s physical dimensions are 400 x 300 x 150 mm; approximate weight is 8kg. 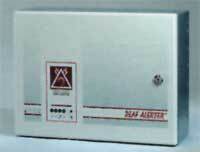 COST: Deaf Alerter is cost-effective to install and low cost to operate. 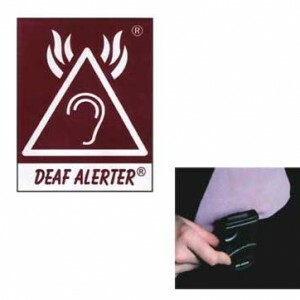 GUARANTEE: Deaf Alerter comes with a 12-month warranty. 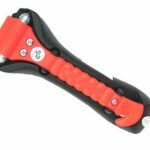 Maintenance contracts are available.